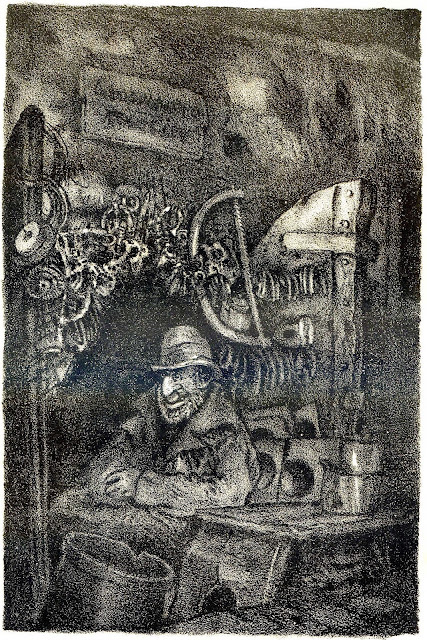 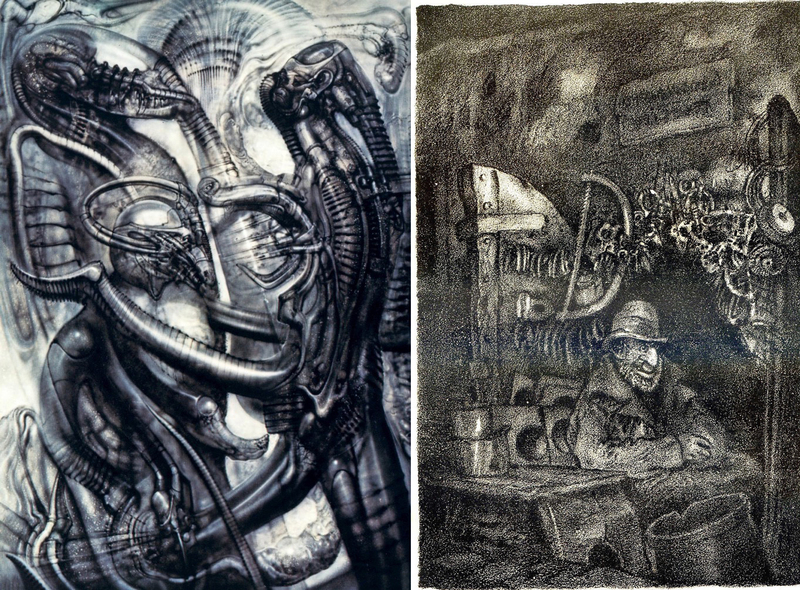 a) 18th August 2015, I'm looking for evidence of Giger being further inspired by Hugo Steiner Prag's artwork for Gustave Meyrink's The Golem. 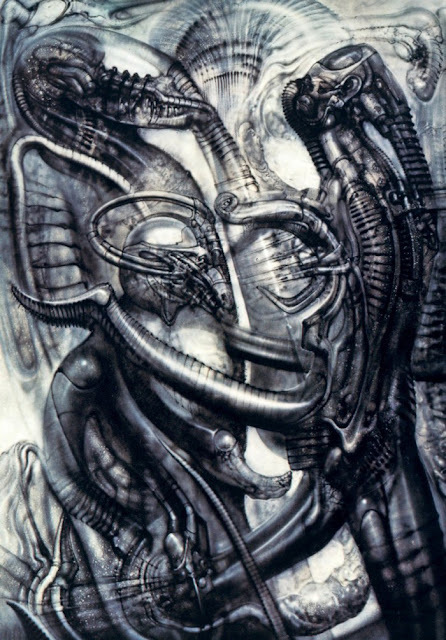 Giger's painting contains approximately three figures, two on the left, one tall with a semi transparent head and a pipe from the face leading to a container like an exhaust silencer from a motorbike, and before him a smaller humanoid with a dog like snout. 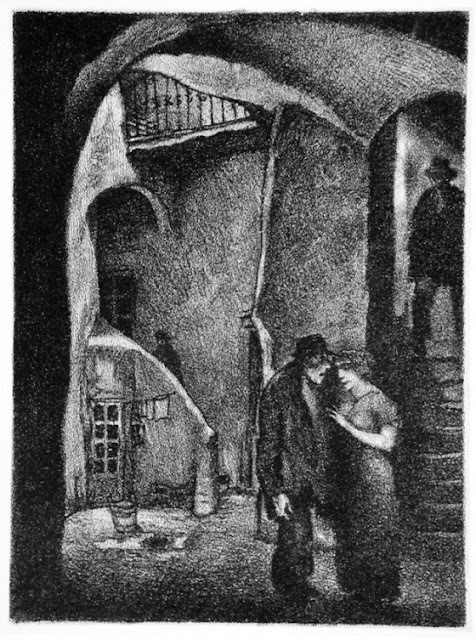 On the right is tall humanoid with a face and ear seen from the side barely noticeable, and a pipe coming out of the back of the head. 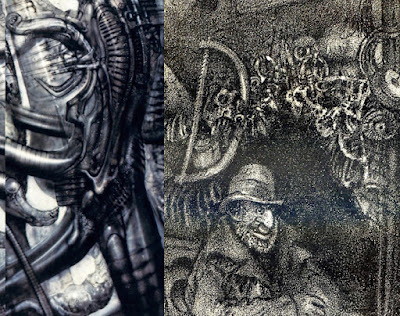 e) Comparing Giger's work 319 and Hugo Steiner Prag's "Vice"
But it seemed that this only revealed a partial set of details and I became convinced that Giger had take something from another picture from the series, and then I came to previous picture in the series Vice. The transparent head of the left figure was developed from the left arch with the railings showing up as the ribbed machinery in the head, and the arch top of the entrance to the passage on the left becomes the shoulder of the entity before Giger decided to replace that with the shape of the open door from Aaron Wassertrum. The ridge in the divide in the arched ceiling takes form in Giger's painting dividing the two heads. . 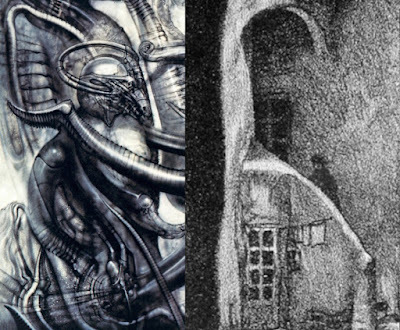 The support of the arched ceiling shows up as a tank from which the left figure's breathing pipe is connected to. . The edge of this support catches the light and becomes in Giger's paintings a space dividing the gas tank and the body of the upper left biomechanoid. . 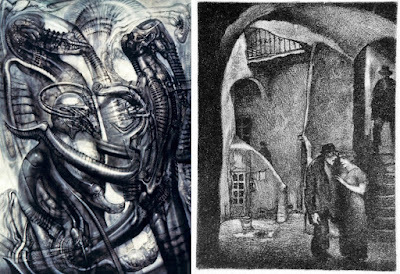 The right abstract figure probably would reflect the shadowy doorway on the right with the figure standing in there, the steps below perhaps turn into the ribbing in Giger's work, but this seems to be a very rough assumption, and perhaps Giger would have been only roughly following any concept. .
One would be asking more questions about the figure on the right with complicated shapes and head gear and left without answers. Detail from Biomechanic Landscape II (work 319) and Hugo Steiner Prag's "Vice"
The slope of the side of the left staircase with the window below becomes the jacket and arm of the smaller figure with the animal like face, the bottom of the side of the staircase becomes a phallus in Giger's work.